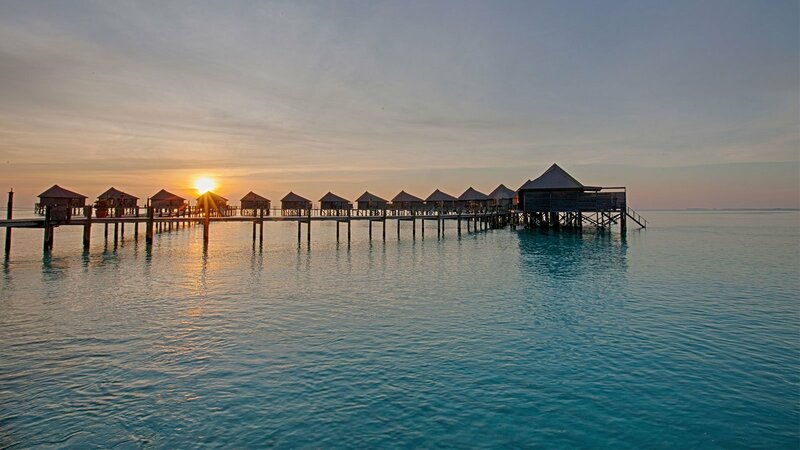 The uncontested winner among honeymooners, Komandoo’s Jacuzzi Water Villas are built on stilts over the lagoon and afford a spectacular view of the Indian Ocean. Rest your eyes on the sparkling sea while sipping on a glass of champagne and take delight in having a balmy lagoon on your doorstep. Komandoo’s most desired villas guarantee a luxurious and romantic atmosphere to your stay in paradise. A large, partly roofed wooden deck with a staircase leading down to the ocean gives you a private slice of utopia. The tranquility of the lagoon is the perfect sanctuary and makes these villas an obvious choice for your honeymoon or a romantic getaway with your darling. Enjoy a nice bath in your own Jacuzzi, spa bath whilst gazing out over horizon where the azure waters meet sapphire-coloured skies. Located just a few short steps away from the lagoon, these spacious villas line the beautiful powdery white beach that encircles the tropical island. These spacious retreats, discreetly placed along the beach, afford a cozy veranda for you to enjoy the sound of the ocean and a spectacular view of the sea. A perfect place of harmony during your holiday.